Pray that you have a blessed and happy time wherever you may be! Meet the Walkers: Ned (Papa) and Debbie (Mom) graduated from Oak Hill High School, Converse, Indiana and married in 1992. They moved to Vero Beach, Florida in 1993 to work full-time at Life for Youth Camp, a non-denominational Christian kid’s camp. God has blessed them with 3 great kids, Samantha, 15, Hannah, 12, and Jesse, 9. This is their 8th year homeschooling and Debbie served for 4 years on the board of Indian River Homeschoolers Association. 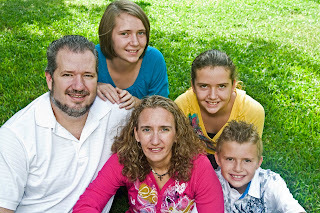 They were active members of Central Assembly in Vero Beach until God called them full-time in January 2009 to missions. Ned worked with the Junior Bible Quiz team for 11 years and Debbie for 8. They taught Preschool classes for 9 years and also helped with various activities around Central. One of their favorite activities was serving as Home Cell Group Pastors for 3 ½ years. Ned and Debbie joined Youth With A Mission Orlando staff in August 2009. They are currently working towards setting up a family-oriented facility where families and individuals can come and serve others and in doing so, realize that God has called us all to share His Salvation Story with others. A place where each and everyone that is a part has an opportunity to realize that God has created each of us with a purpose and a destiny in His Hands. You can contact them at Walker5forGod@yahoo.com or 772-360-8231(Ned) or 772-360-9393(Debbie). Tax-deductible gifts can be given online at YWAMOrlando.org/give or checks made out to YWAM. Please DO NOT put our name on the check but put our name on the envelope to the address above. Developing a place where other families can serve together and see each other through God’s eyes is our goal. To develop a place, partnering with YWAM Orlando, that will provide security and safety at the end of the day after meeting needs in the community during the day. We will be traveling to the Dominican Republic in January on a scouting trip for just such a place. Come out and enjoy some fun and fellowship. Bless the Walkers and their ministry by bringing a donation in a white envelope. Ned and Debbie Walker are working with YWAM Orlando. You may also go to YWAMOrlando.com/give and donate a one-time gift or set up monthly support. Checks may also be sent to Ned Walker at YWAM Orlando PO Box 620487, Orlando, FL 32862.
is currently working towards setting up a family-oriented facility where families and individuals can come and serve others and in doing so, realize that God has called us all to share His Salvation Story with others. A place where each and everyone that is a part has an opportunity to realize that God has created each of us with a purpose and a destiny in His Hands. This email was sent to walker5forgod@yahoo.com by walker5forgod@yahoo.com. 1Thessalonians 5:16-18 says, "Be joyful always, pray continually, give thanks in all circumstances, for this is God's will for you in Christ Jesus." The Bible is full of requests and instructions for prayer. That is what we are asking of you now. We are currently working towards setting up a family-oriented facility where families and individuals can come and serve others and in doing so, realize that God has called us all to share His Salvation Story with others. A place where each and everyone that is a part has an opportunity to realize that God has created each of us with a purpose and a destiny in His Hands. In January, we are scheduled to go on a scouting/serving trip to the Dominican Republic to look for a suitable area for this facility. Starting Monday, November 23rd through Wednesday, November 25th; we will be praying for a financial breakthrough in order to turn this vision of a facility into a reality. Our family will be praying at 9:00 am, 3:00 pm and 9:00 pm each day for this breakthrough. Will you join us in prayer during these three days? On Thursday, November 26th, Thanksgiving Day, we will be having a special time of thanking God for supplying the finances that we are need of! 1. We need to reach our monthly committed support level. This is support that is pledged to be given each month. 3. Avenues to share our vision and find others who are willing to partner with us. Encouraging others to grasp hold of the fact that each of us has a purpose and a destiny in God's Hands is part of our vision. Thank you for your willingness to join us during these next few days of prayer and thanksgiving. Feel free to send us an email letting us know that you are standing with us during this time. Also, share with us any ideas, thoughts or verses that God may speak to you during this time. Good times, good food, good friends, good memories? Probably a little of both if we were completely honest. I think it is different also if you no longer live close to home. We have not lived by our "hometowns" for almost 17 years now, so going home during this support raising trip was a lot of fun. Some things change and other things don't! What are you doing to make your home a better place? Is it all physical touches or will there be lasting spiritual touches as well? This is not our home! The Bible reminds us of this. Our home is in Christ. May we be reminded of this and think towards going home and help others find their way home to the loving arms of our Heavenly Father! We appreciate your prayers during this time of support raising! Math lesson including mileage figuring and most economical ordering at Waffle House! Intense!! Ear infection for Jesse! Ned and I finished up our Lecture Phase for the School of Ministry Development (SOMD) on Thursday, September 24th. We packed up and left Orlando after dinner on Thursday night. Friday was Jesse's 9th birthday!! He enjoyed a great birthday, starting with Saints, home school PE, in the morning and ending with dinner at Sonny's! A great time with the Marine and Pastor families in between! We had a great visit and stay with the Pastor's in Vero Beach! Thanks a ton guys for housing us! 500 miles: We set out this morning from Vero Beach, Florida and ended up in Columbia, South Carolina. One of our first assignments as YWAM Orlando staff is raising our minimum monthly support. So off we go to speak to as many friends, pastors, youth groups, etc... as possible. Lunch with an old friend from high school: Met up with a friend from high school that now lives in Jacksonville. We enjoyed a great time at lunch. It is so neat to see someone you haven't seen in over 15 years and it seem like it was just last week. God unites hearts for a lifetime! Spanish Lesson x2: We are headed for a scouting trip to the Dominican Republic in January so we are learning some Spanish. We have a cd Spanish program so we not only listened to lessons 1-3 once but two times! We are doing our best learning! The River by Gary Paulsen: One of Sammi's favorite books is Hatchet by Gary Paulsen. Uncle Thom read it aloud to her when she was in 3rd grade and it came alive to her. She even bought herself a hatchet at a yard sale shortly after! We just re-read it a couple of weeks back and read the sequel The River today as we traveled. It did not last all 500 miles! We gotta get into the home school crate and get another book for tomorrow. At this rate, we are gonna need a couple more books before we get back to Vero Beach! Math lesson including mileage figuring and most economical ordering at Waffle House! : Gotta have some math! I love teaching practical application Math to the kids when possible. I think it makes them appreciate learning when they realize they need it for the future. Journaling : Hannah journaled more today than she ever has at one time. She was excited to see that there were so many trees in South Carolina! Bible Reading: Daily manna is an essential! Intense!! Ear infection for Jesse! : Poor little guy has quite the ear infection. He slept quite a bit today and we could all tell he just wasn't feeling great. We are praying for total healing and no pain. Priceless Family Bonding Time! : There is nothing like riding along in the automobile to bond a family. We read, sang, listened, learned and definitely laughed together today! What a blessing to spend time as a family. Enjoy your family and make sure you tell them you love them. Maybe even a hug or two! We are now offiically YWAM Orlando staff!! When God first laid it upon our hearts to go into full time missions, He also spoke to go with am organization. Not just to go off as "rogue" missionaries but to partner with someone. Through the Lord's leading and the recommendation of some key people we came to Orlando and did our Discipleship Training School and now are doing our School of Ministry Development with YWAM here! It has been amazing! God has definitely made us a part of the family here and they have welcomed us! As of Friday, August 21, 2009, we have done the first step that the Lord directed us to do. Actually He has just fulfilled what He set out to do. We have just been obedient to listen and obey! This is what we plan on continuing to do. We are currently planning a support raising trip and then an outreach scouting trip to the Dominican Republic at the end of September. Hope to see you somewhere along the way! Is this funny or not? One of the guys in our group just asked this question. Is it wrong to think this is kind of funny? What is "this" you wonder. So we broke down as we were traveling along the Interstate. As the van was being fixed, we were able to eat a nice lunch and utilize the free wi-fi internet at the restaurant. It was not too long a wait and we were headed on the road again. Ned told Ben we needed to get gas so we drove across the street to fill up before hitting the road. Great idea except the van broke down again! We can still see the garage! The mechanic gets the van started to drive over to the garage only to have it break down in the middle of the intersection. AHHH!! So is it wrong to think "this" is kind of funny? No, it is not wrong!! Laugh at life! Ask God what the next assignment is. Obviously, we are still supposed to be here. We have found out that the waiter proclaims Jesus Christ as his personal savior. Although, he also said he was mormon?? Not sure about that but he proclaims with his own words that Jesus is the only way to get to heaven. As we walked back into the restaurant, the staff greeted us and the waiter said, "Well, I guess God has a reason for you to stay here a bit." So we sit with Bibles, journals, debriefing questionaires, laptops, cell phones and ipods waiting. Giving our lives and our minds and thoughts to Jesus Christ our Lord of Lords! Asking what's next God! We are waiting, being obedient to God regardless of if it seems totally outrageous and radical to the rest of the world!! So ask yourself: Is this funny or not? Maybe not funny but how is your attitude? Have you given your current situation to God? Trust Him to give you a divine appointment today even if it means breaking down and hanging out at some strange restaurant in Hattiesburg, MS!! Why are the Walkers in Hattiesburg, MS you ask? Well the van broke down. We are traveling on Mobile Team with a 15 passenger van pulling a trailer and a minivan. The 15 passenger decided to stop running.. Jaymaseeki!! (Praise the Lord!) We were able to pull over safely and the van has been towed to Hattiesburg. We are currently having a nice lunch at Sweet Peppers Deli while we wait and they have free wi-fi!! God is good!! Just wanted to share some of what we were able to do in New Orleans. We were able to go on some prayer walks down on Bourbon Street and thru the French Quarter. We did some evangelizing as well. God allowed Ned and I to meet and encourage a Christian shop keeper who was so excited to know that there were people walking and praying for the city. Prayer moves the Heavenly's even if we do not see in our eyesight what is happening. Cornerstone Christian Church along with Pastor Jimmy and Frances Autry were amazing hosts for the days we were there. They hosted a special Youth Service on Saturday night and we shared at church on Sunday morning. We did not have a huge turn-out numbers-wise at the Youth Service but it was such an encouragement to the church and to the youth. God allowed me the privilege of praying with a young man as he accepted Jesus Christ as his Lord and Savior for the first time. What an honor it is to be used by God! I was so amazed to be given the opportunity to preach during the Sunday morning service. I spoke on being part of the body and how God was using us, an "ordinary" family to serve Him. Each member of our family shared for a moment on an experience in India. My encouragement to you all is to allow God to push you out of your comfort zone and allow Him to use you for His glory. If you allow Him, He will definitely use you and who knows where you will end up!! Heaven knows I never dreamed I would be preaching in New Orleans!! Sorry for not sending an update for a few days. We are currently on Mobilization Team. Our group of 35 split when we arrived in Newark, NJ. Our group of 20 arrived in Orlando, FL at 10:30 am on Friday the 22nd. On Saturday, after a whirlwind of doing laundry and repacking:) we headed to Fort Lauderdale where we spoke at First Church of the Open Bible Sunday morning. We then shared at Central Assembly in children's church that Sunday night. Monday was an outreach at the beach in Vero where we handed out waters and some tracts. Tuesday, we helped prep a church for repainting after it was smoke damaged by a wildfire. Wednesday was a fun youth service at King's Baptist in Vero. What a blessing it was to see some of you in Vero. Thanks to the Littleton Family for housing and feeding us. Thanks to the Marine Family for the fun cook-out. We are now traveling to New Orleans where we will do some street evangelism and service projects along with sharing at some churches. Then on to Coleman, Alabama for some more sharing and service projects. Please pray for traveling mercy's and for the health of the team. We have had a couple girls who have been a bit ill since coming home. Our family will be sharing at Life for Youth Camp in junior chapel the weeks of June 7th and June 14th. We will then start our secondary school on June 22nd. This school is the next step which is mandatory for joining staff with YWAM Orlando. Please be on the lookout for our next newsletter that we will be sending out the first part of June for more information on our future plans. We would love to visit with you while in Vero so please give us a call. Debbie's phone was lost or stolen while arriving in India so the majority of phone numbers were stored there. We would appreciate an email with your phone numbers if you would. We are excited to share our experiences in India with you when we have an opportunity. God is moving in India and we have the privilege to see it!! Friday, the Coffee House that is run by the base here showed the Passion of the Christ. For 3 days we passed out flyer's and invited students from the university area. After the movie, Natalie (on our team) and Ned were sitting with 5 university students and explaining the movie and answering questions. I sat to pray for them and soon all three of us were sharing. We shared for over an hour and answered many questions. As they started to leave and we felt very strongly to ask if any of them wanted to accept Jesus at that time. Three of them said yes, we want to accept Jesus as our Saviour. One young man looked at us and said so enthusiastically, "I BELIEVE!" There is no greater pleasure than to have the privilege of leading one to Christ. We are all well. Children are well and we are looking forward to the last bit of ministry. Please pray for unity these last 2 weeks for our team. We have worked so well but of course the enemy wants to attack. Also, please pray for Ned. He slipped down a flight of stairs and is in pretty bad pain from his right side and back and his right elbow! Happy Mother's Day to each of you that are Moms!! The biggest news item right now is that Jesse won gold internationally!!! The Base here has a TaeKwonDo (TKD) ministry that Jesse has been able to participate in since coming. This has been really good for him as there are not really children in the area that he can just go and play with. He has done amazing with going along with Ned and/or I and participating with us in ministry. So TKD has been a great outlet for "pent-up" energy. He was invited to participate in the District Competition on Sunday. His attitude about competing was: "not all kids get to fight in another country". He did really well and won the gold medal. It was so funny because at the first match the attention all turned to the mat he was sparring on and you could hear the words "international match" going thru the crowd. It was the same for the final round. It was so neat for the club here as they really use this as a ministry to give the glory to Jesus. All the kids knew Jesse's name by the end of the day and would call his name and wave. Jesse would just wave and was pretty clueless about all the attention which just made it even sweeter. The club here has two participants going on to the state competition and then can try for Nationals. Hannah has been mistaken again for a 15 or 16 year old because she has gotten so tall. She is so funny about this. It just cracks her up because she does not see herself as older at all! Sammi is enjoying the campus ministry that we are doing now. She loves talking to new people and just praying for them. We as a family will visit a cell group that a Brother has at his home on Friday night. We are very excited about this and he is too. Saturday morning we got up early and visiting Monkey Park. We saw peacocks and a big snake along with lots of monkeys. We are doing well and enjoying seeing God work through us and our team. We have met a lot of Christian Indians who were saved due to missionaries years ago coming to their villages and tribes. It is neat to encourage them. We have seen a lot of salvations also! Blessings and love to you all! Hello All! We leave for India in 4 days!! Next week we will be sleeping in New Delhi! That is totally crazy to us when we really think about it. These are all yet to be seen! We do know that God knows! Do I really trust God? Do I trust Him to know where I am at and that He is in control and He will provide all of what I need? Yes, we do! So off we go! In 9 weeks we will have all of the exact answers to the above questions but until then we will obey the voice of the Lord and those He has placed in charge of us! Thoughts - Do we think about our thoughts? What is in our mind? Word - Do we watch our words? What about what we say to our family? Actions - Do we diligently watch what we do? Where we go? Habits - Do we have habits that would be displeasing to God? Character - What do we do when no one is watching? This is our true character. Destiny - God has a destiny and a plan for your life. Are you listening to Him and following His leading? This is what God has been placing on my heart over and over and over again in the past few weeks of schooling here at YWAM! From different angles and different people but it all points directly back to doing what God wants. Proverbs 19:21 says, "Many are the plans of a man's heart but the purpose of the Lord shall prevail." Am I allowing the Lord's will and purposes to prevail in my life? I sure hope so because that is where I wish to be! Right smack dab in the middle of His Will! Even if it is messy and not so sweet some times. That is where I belong! What is the Lord speaking to you about? What is He challenging you to change in your life? This week's teacher said, "If you can't hear God's voice, what is filling your mind in its place?" God, never let me fail to hear your voice! 12 Hours PLUS!!!! trapped on the bus! Not really trapped. Add it all together and you get quite a combination! Wait! Did I mention the countless number of water drops?? What fun. When it rains, it pours so the saying goes! Well when it rains on this bus it pours inside! Okay, Okay! Pours is a bit of an exagerration but it does run in pretty good. So what kind of person are you? What does that have to do with the rain on the bus? (That's not part of the song by the way) That was the trouble that faced our group earlier and makes me think. What kind of person are you? The kind that tries to fix the problem? The kind that sits back and just watches and is somewhat amused? The kind that has all the answers but does nothing? The kind that complains? Or do you just sit and try to make the best of the situation? We all have different reactions to what comes our way. Big things and small all have different effects on us. And also how much or how little sleep we got the night before has something to do with it! We all want to be the kind of person that will react the right way. Just enough "do something" in us combined with just enough "it'll be okay". What fun it is to have God throw us in some interesting situations and see what rises to the surface. Frustration, fear, anger, amusement, criticism? What reaction do you find comes out the most in your life? If it is not the reaction you want, try praying and operating in the opposite spirit. When we have issues with our children, we work on teaching the reactions that we want to see but are not. We should do the same for ourselves. This is not always an easy thing to do because that means we must recognize and diligently work on areas of our life that we are not satisfied with. God will give you the guidance and the strength though. God is forgiving and a great help. So, what kind of person are you? Look and see, in your own life, if God is leading you to work on something! Have a blessed day! And yes, I am writing this as I am still on this bus and YES God is showing me things to work on. Not just today but everyday so that I can be closer to My Father and more like the SON! What a profound song! Okay, not too profound in the true sense of the word, but it can give some insight into all of our hearts. We don’t really want to be an Oscar Mayer weiner! We really just want to be loved. The love that permeates our souls and our beings. The love that says we are important to somebody, somewhere. The love that resonates that we are good enough to do something, anything that is worthwhile. The cool thing is: We can find that love. We find it in Our Heavenly Father’s arms. God does love you and you are something worthwhile. What you do is important. "Everyone" may never know my name and "everyone" may never love me. But the one True God loves me so much! And what I do is important to someone. It may just be my husband or my kids! But that makes is no less important. I have found what I want and that is to be loved! I am loved by the Lord and so are you.